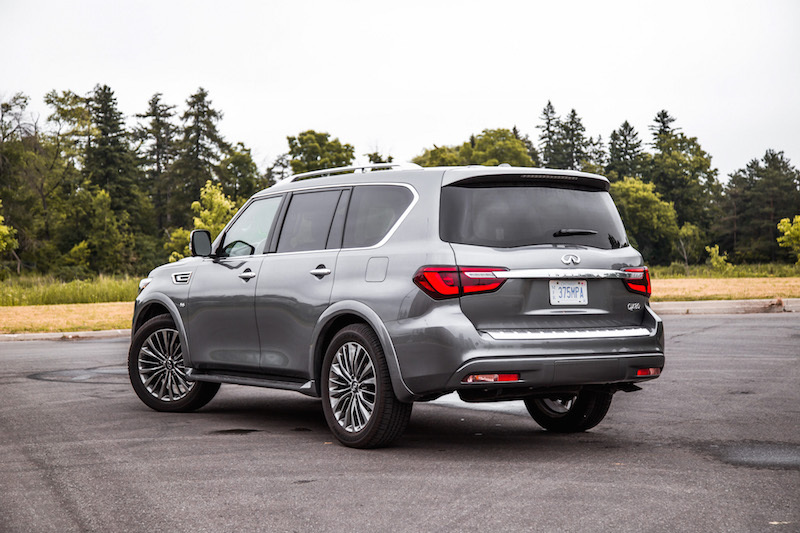 The 2018 Infiniti QX80 is an aging dinosaur wearing a Uniqlo shirt. Fundamentally, this Japanese behemoth has not changed since the second-generation model debuted in 2010. 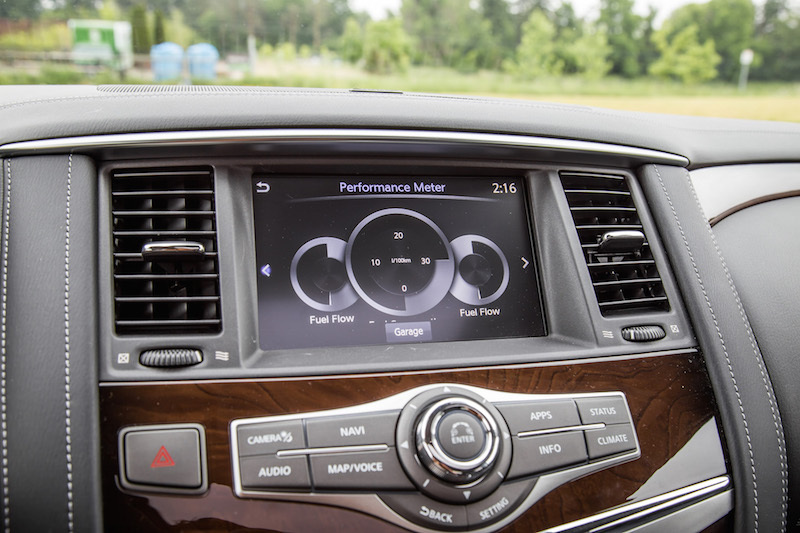 It sports the same powertrain, chassis, and platform, though this dog has learned a few new tricks along the way with added safety technology, infotainment features, and interior appointments. 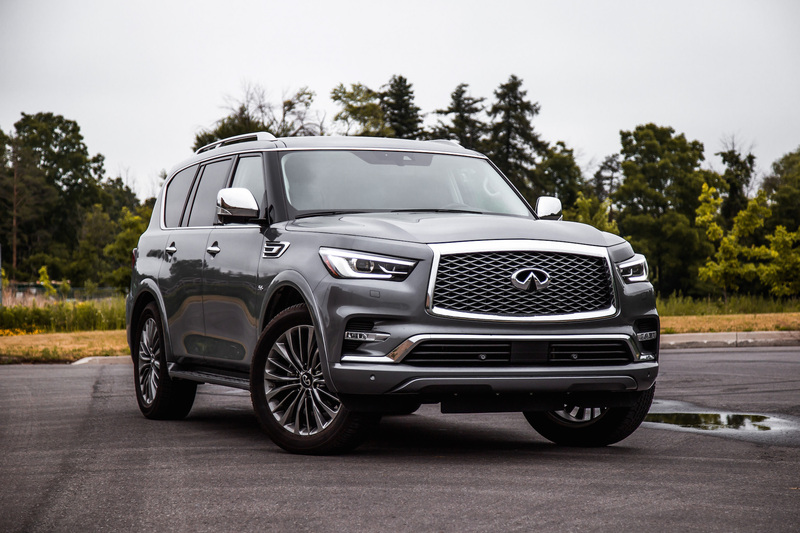 Changes in the full-size SUV realm are seldom, but the QX80 wears a new face for 2018, adopting sleeker LED headlights, thinner taillamps, a raised rear bumper, and a toned up snout in the form of a longer raised hood to fall in line with the design language set forward by the Q60 and QX60. 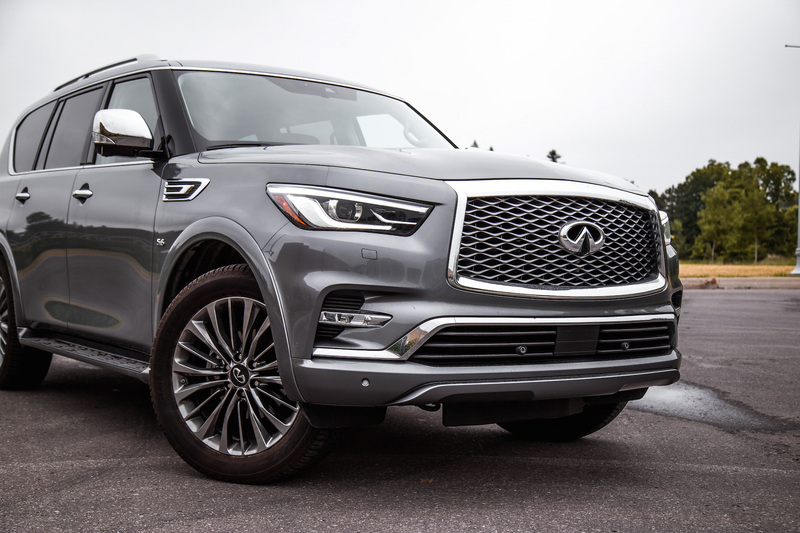 The QX80 is aging like a fine wine, and I still think it’s good looking, definitely less gaudy to stare at than the Lincoln Navigator or Cadillac Escalade. 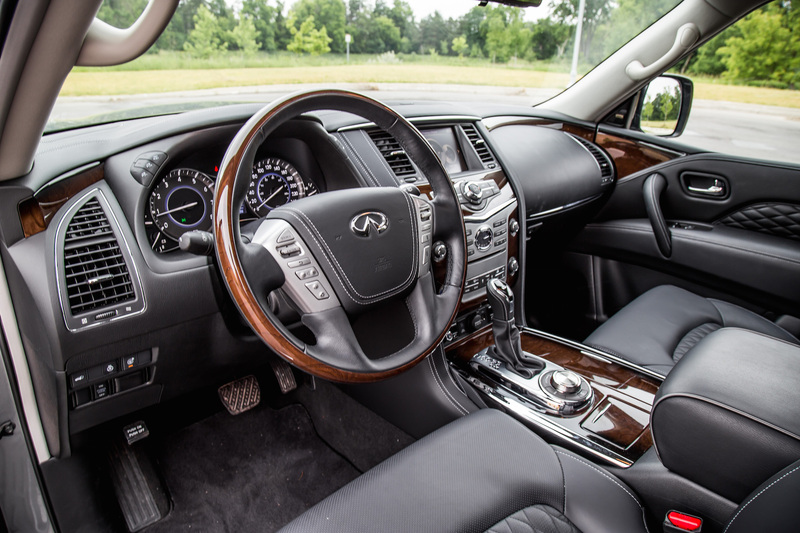 The same can’t be said about the interior, which looks identical to previous models. 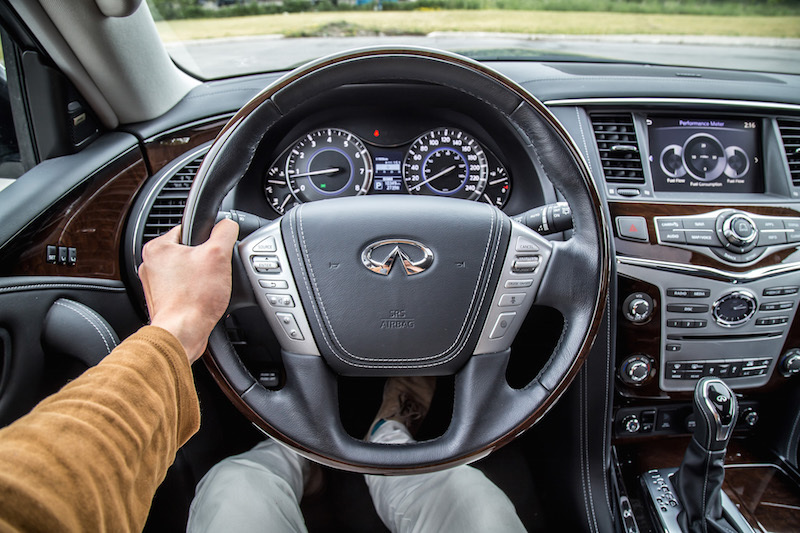 The only differences are the redesigned leather-stitching steering wheel, cobra-like gear shifter, infotainment system from the Q50, and larger rear entertainment screens that can now display individual content on each screen and include HDMI and USB supports. The cabin is still a vast and cozy place to spend time in, and the soft and luscious semi-aniline leather has me swooning. The seats are wide and plush, the third row seats are equally as spacious, and outward visibility is excellent with large side mirrors and an upright seating position. 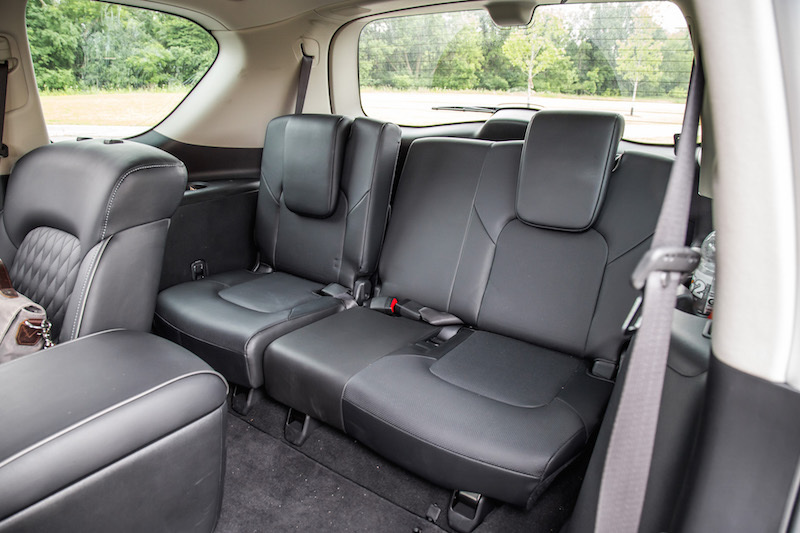 You can opt for a seven or eight-passenger configuration, with the second row seats donning a two-seat captain’s chair spec or a three-seater bench. 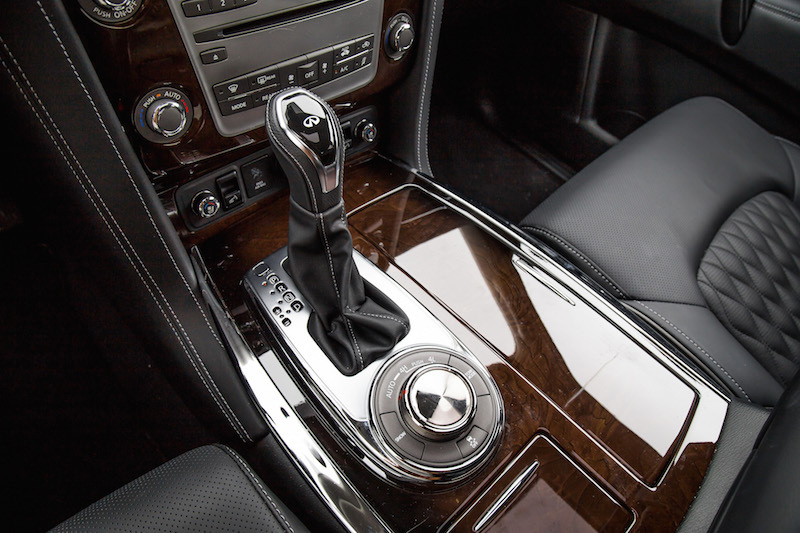 The center console is button-intensive with a physical button or knob for pretty much every function imaginable. You really don’t need to dive into using the touchscreen, which is a good thing as the screen is situated quite far away from the seats, meaning you have to bend over and about to reach it especially if your arms aren’t like Mr. Tickle’s. 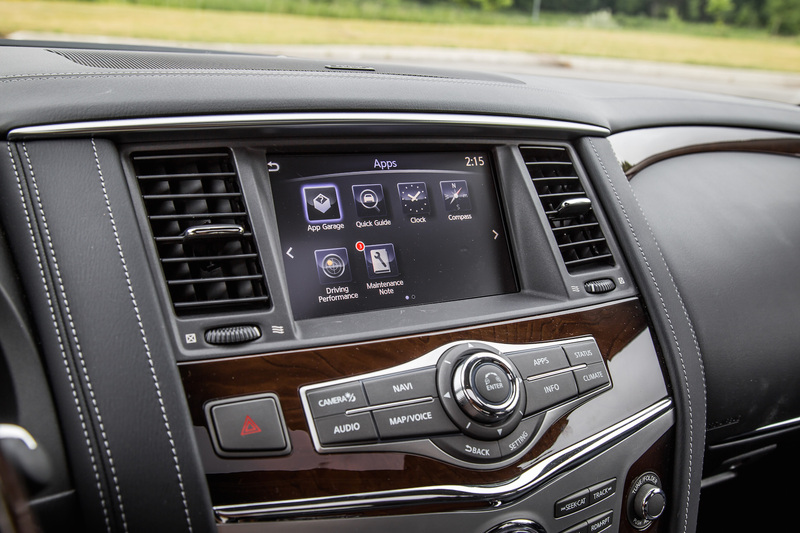 The cabin may not be as luxurious or as modern feeling as the QX80’s main rival, the Lexus LX 570, but it feels more purposeful and user-friendly, especially with Lexus’ horrid mouse-like touchpad. The analog clock is a nice touch, and the standard Remote Engine Start function built into the keyfob is a god send during cold Canadian winters. 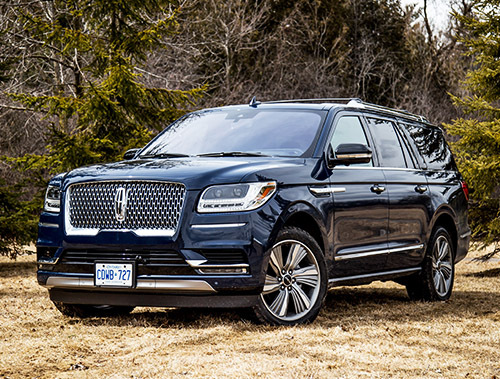 Aesthetics and functionality aside, what is it like to pilot this land yacht? 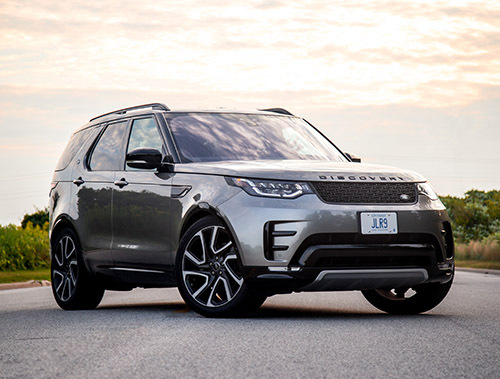 Dishing out 400 hp and 413 lb-ft through a seven-speed automatic transmission, this naturally aspirated V8 provides ample acceleration followed by a deep roar and heavy breathing at idle. I never found it underpowered or unresponsive, and was a potent companion. But do expect some body roll. 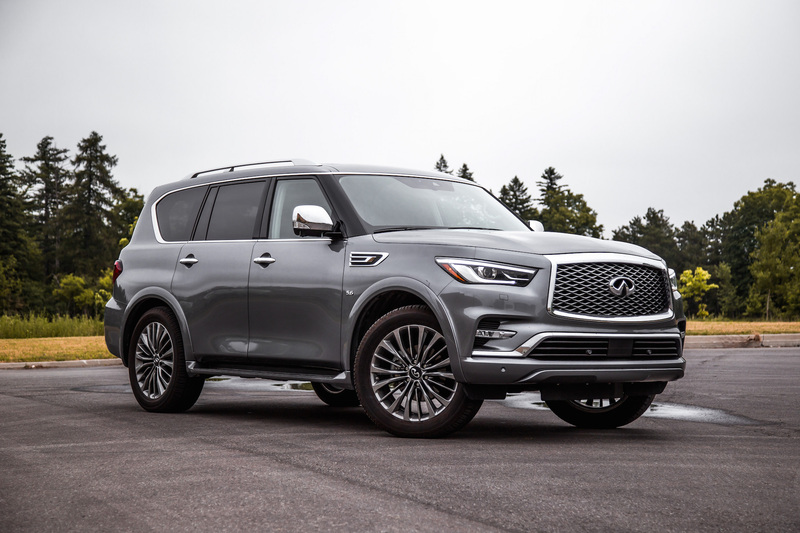 Of course I don’t know what I was really expecting coming out of this - the QX80 is a massive castle floating on top of springs trying their best to move heaven and earth. On the other hand, the ride is plush and quiet. 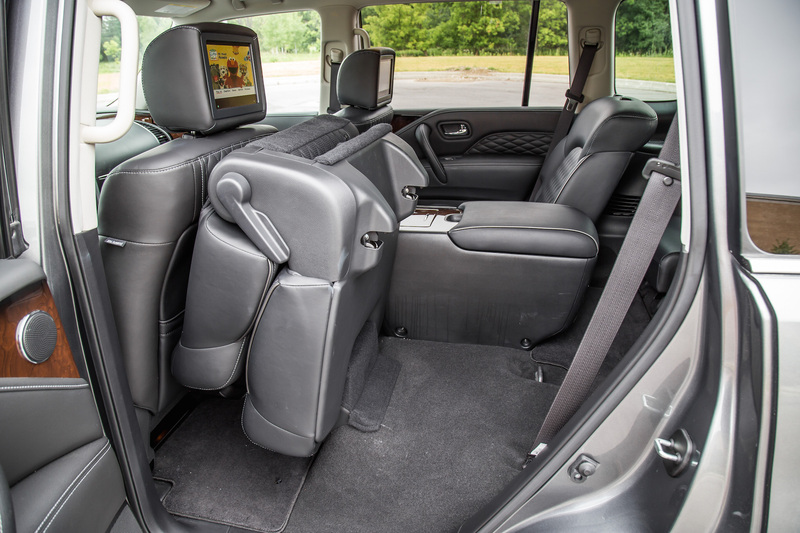 Vertical motions are expertly kept in check and bumps hardly disturb the occupants. 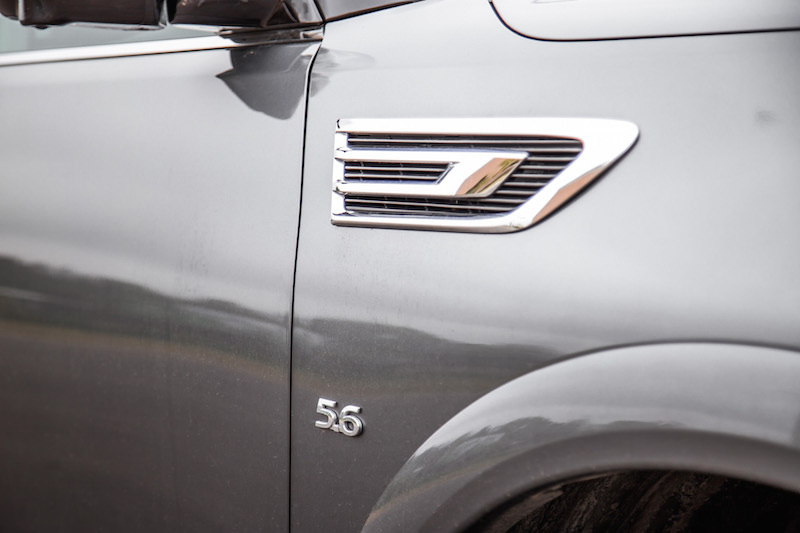 As with every car review, there are always a few gripes, as minor as they may be. 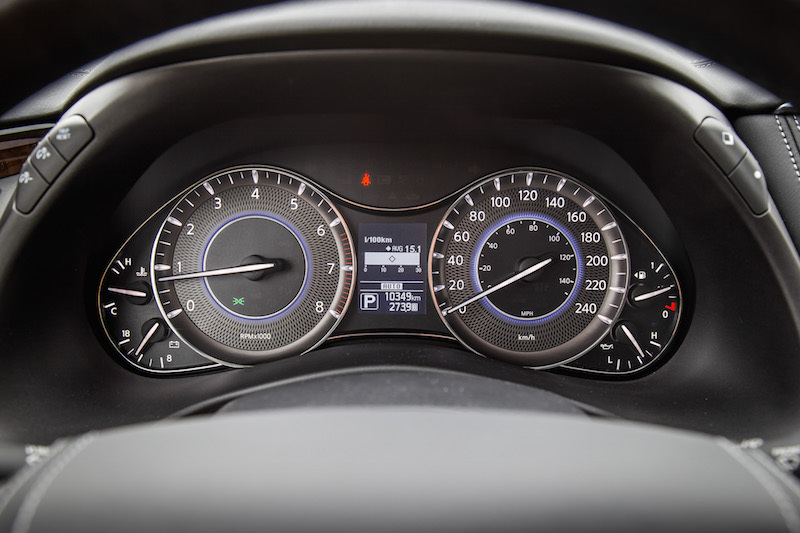 Firstly, the fuel economy. 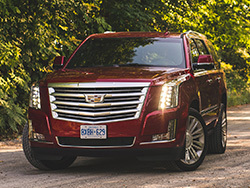 This naturally aspirated V8 is a thirsty one, and doesn’t come with any modern fuel saving measures like “start/stop” to switch off the engine during idling, or even cylinder deactivation under light loads, both of which you will find on rivaling SUVs. 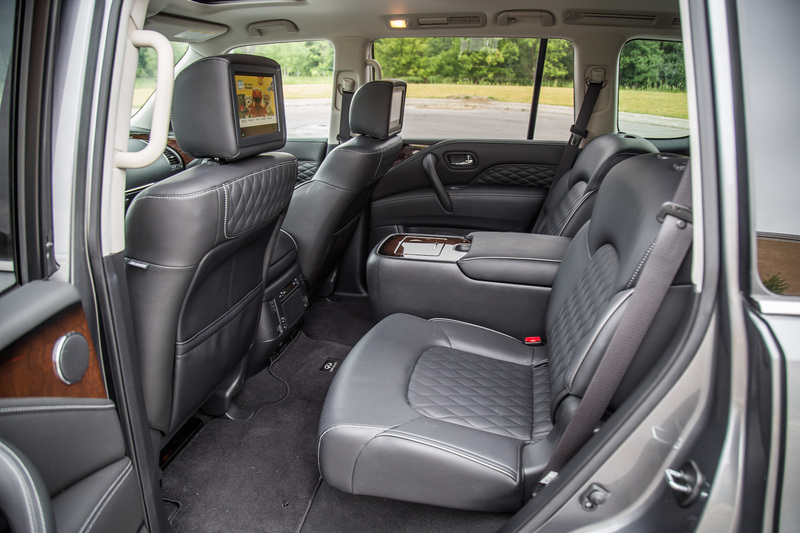 Other missing features include a panoramic sunroof that extends to the second row seats, massaging seats, or a head up display. The Bose audio system is phenomenal, though. Secondly, there are some areas which could use a bit of garnish. 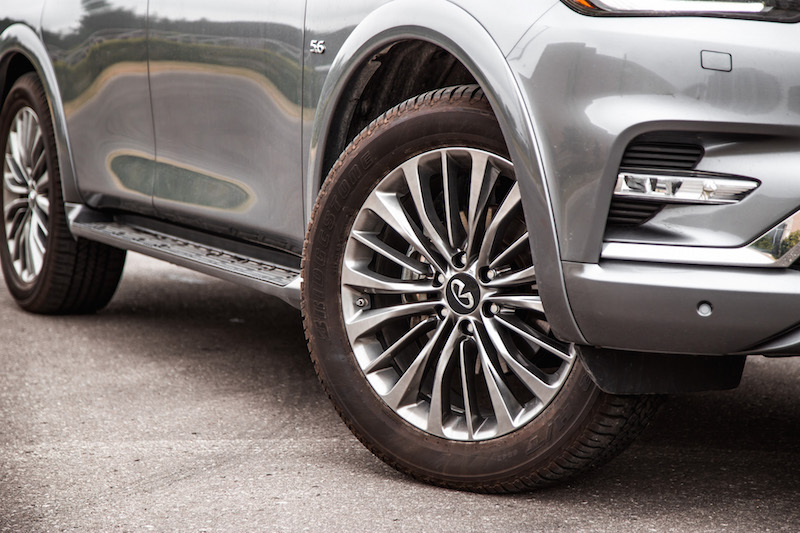 The doors feels especially thin and cheap, a nod to its base foundations in the Nissan Armada. The panel is thin, and doesn’t offer much of an armrest on the window sill either. 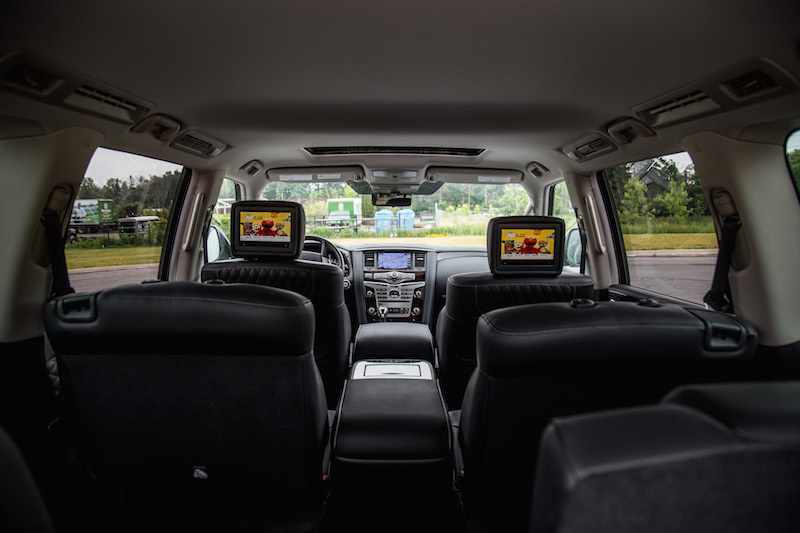 The excessive nose diving exhibited under heavy braking might scare off a few of your passengers as well, but let’s hope those larger rear screens keep them distracted. The new looks may not fully mask its aging platform, but the QX80 has always been a potent and luxurious full-size SUV, and continues to chug along despite other competitors like the Lincoln Navigator and Land Rover Discovery eagerly pushing the boundaries of technology and efficiency. Old school is a kind way of putting it, and the QX80 does retain a lot of charm and wit by doing so, along with a price tag that significant undercuts its competition. 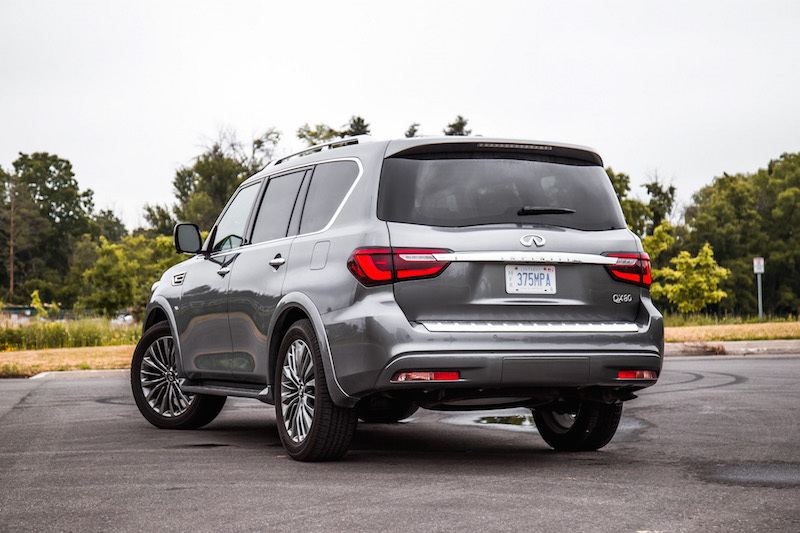 Changes in the full-size realm do come seldomly, so we don’t expect any radical changes to the QX80 anytime soon. 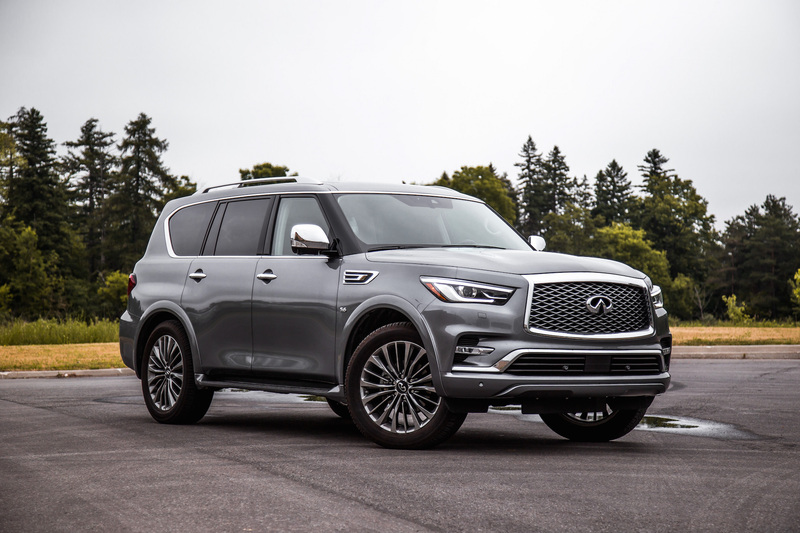 But in the meantime if you’re in the market for an SUV to ferry around eight passengers, and one that values comfort above all else, then the reasonably priced QX80 deserves a spot on your shortlist.